Where $a = f(\alpha)$ and $b = f(\beta)$ or $a = f(\beta)$ and $b = f(\alpha)$ respectively. We can now use this newly derived formula to determine the area under a parametric curve. Determine the area under the parametric curve defined by $x = 6(\theta - \sin \theta)$ and $y = 6(1 - \cos \theta)$ on the interval from $[0, 2\pi ]$. Determine the area inside the curve defined by the parametric equations $x = \cos t$ and $y = \sin t$. 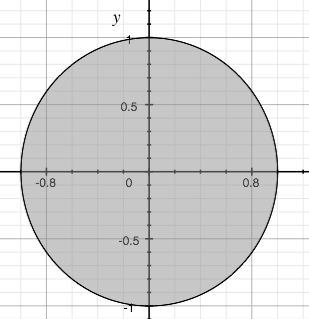 This circle has radius 1, and hence we should obtain an area of π. We can now verify this using parametric equations. Clearly the area cannot be negative, so we take the absolute value of $A$ to get that the area is $\pi$.